As a quick appertizer or a fancy side dish, this verrines are simple and very effective. This are the lentils I have always at home, as they come near-by my in lwas, and the father of a dear friend is a major grower. They are quick to cook and they don’t need to be soaked before cooking. But you can use any kind of lentil you have at home or you are used too. 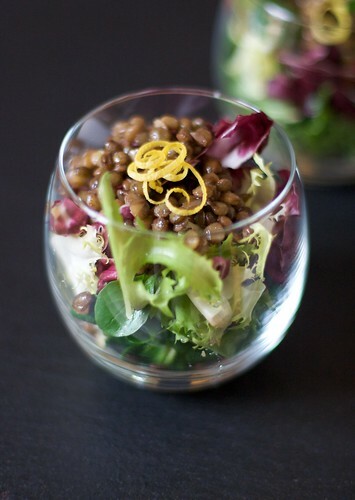 Cook lentils in salted boiling water for 20 minutes or until tender, but stil slightly crunchy. Beat together oilive oil and lemon juice. 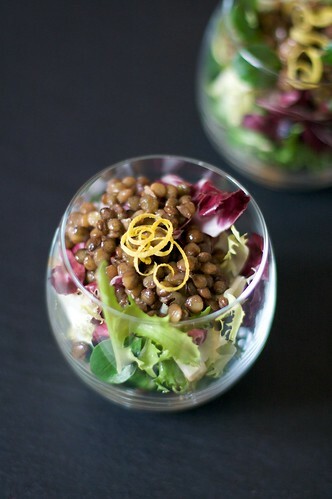 Feel a small glass with the salad, add lentils over it and dress with olive oil and lemon juice. If you feel like it, decorate with lemon zest. What a delicious picture! I love lentils and always make them warm, in a “hot pot” with pork (petit sale). But I habe to try this way, so delicate!